These are mostly oil on canvas and represent some of the art collection assembled by Volodymyr Bilyayev Belanger (Walter Belanger). He was the Managing Editor of ContempoArtUkraine magazine until his untimely passing in 2006. Mr. Belanger sought to bring awareness of Ukraine's cultural heritage to the United States. He discovered highly talented artists and his mission was to provide encouragement, training, supplies, exhibitions necessary to showcase their work. 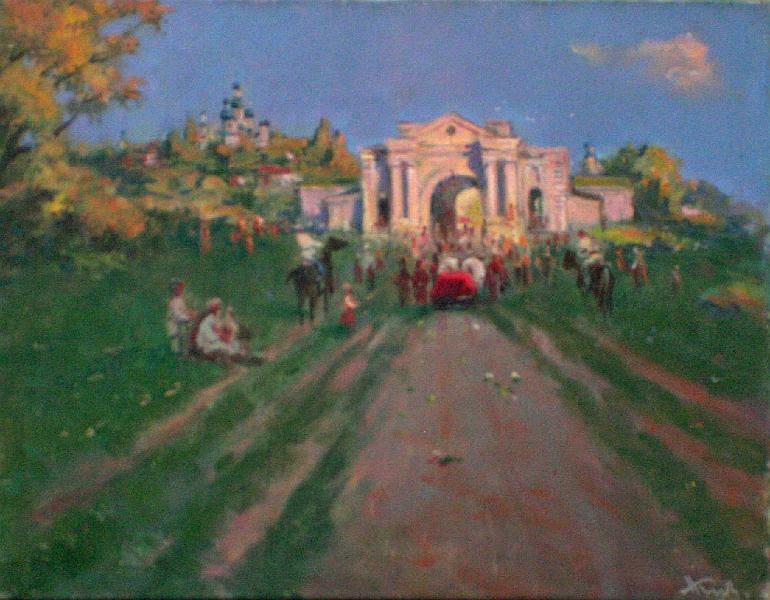 The collection has paintings by Kyzenko, Ivaniuk, Dupliy, Chernova, Karnatovych, Orel among many other artists known and "unknown" in Ukraine. 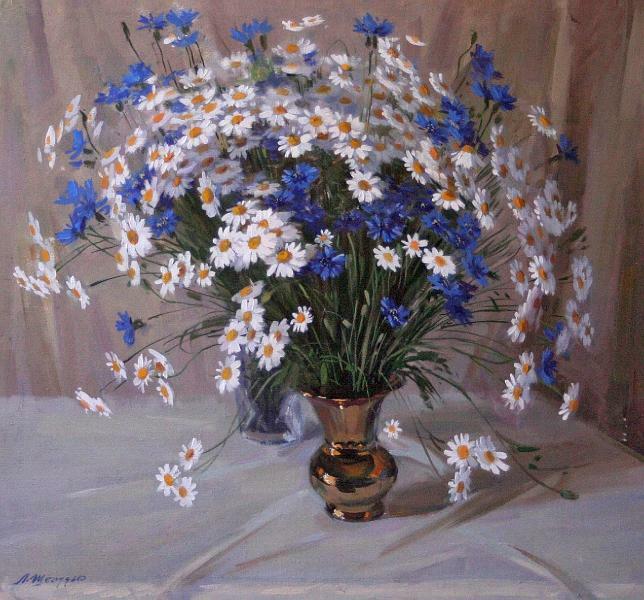 A Still Life example by Leonid Sheludko, "The Secret Vase"
Most of the landscape art showcased in Ukrainian Village Life linked at the bottom is by Nestor Kyzenko working in the 1990's. He painted scenes from memory of his childhood in the 1920's and 1930's. Using the quoted definition below, Nestor Kyzenko was an Impressionist artist. Impressionist art is a style in which the artist captures the image of an object as someone would see it if they just caught a glimpse of it. They paint the pictures with a lot of color and most of their pictures are outdoor scenes. Their pictures are very bright and vibrant. The artists like to capture their images without detail but with bold colors. Some of the greatest impressionist artists were Edouard Manet, Camille Pissaro, Edgar Degas, Alfred Sisley, Claude Monet, Berthe Morisot and Pierre Auguste Renoir. 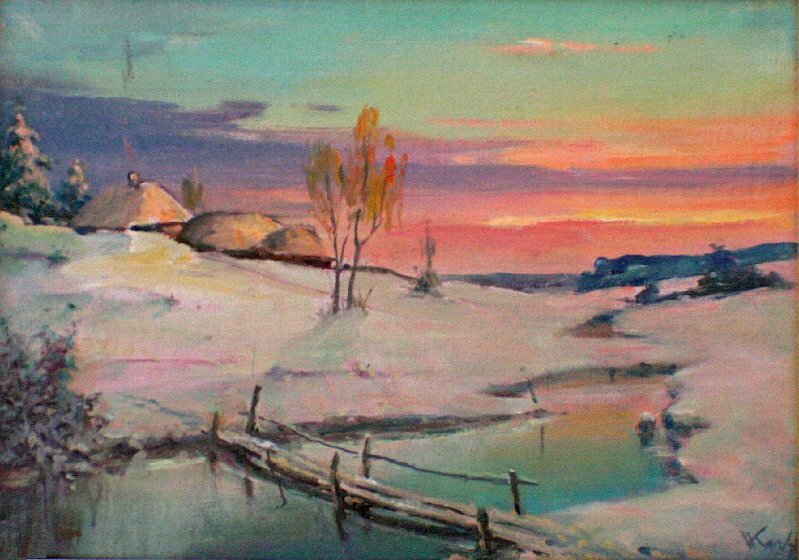 Kyzenko painted scenes which reflect beauty, serenity and natural man's peaceful spirit before and during a brutal, dark period created by Dictator Josef Stalin. Stalin's Collectivization induced famine, Holodomor, is yet another Great Crime of the 20th Century. 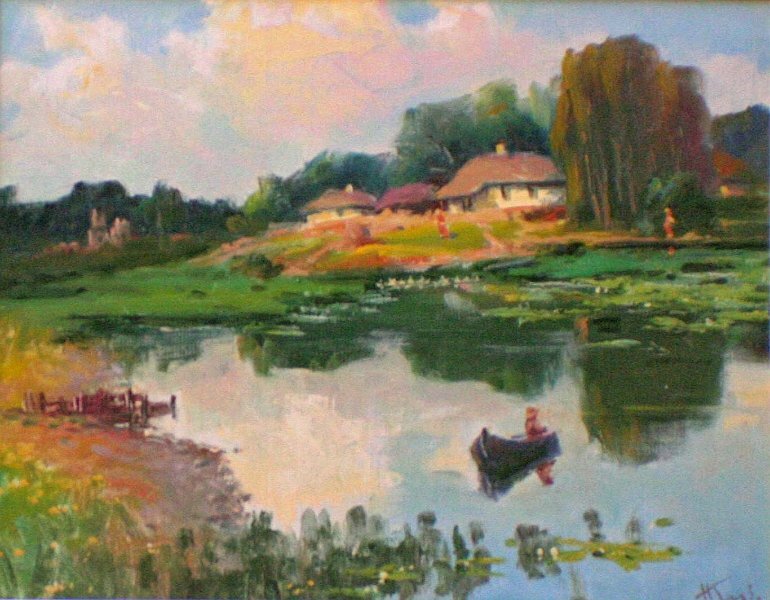 Mr. Kyzenko passed away in 2006 and his work should be remembered as I believe he was considered the premiere landscape artist of Ukraine. 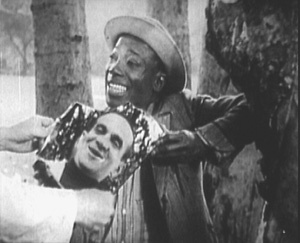 A sampling by Nestor Kyzenko of the Village (Shtetl) scenes. 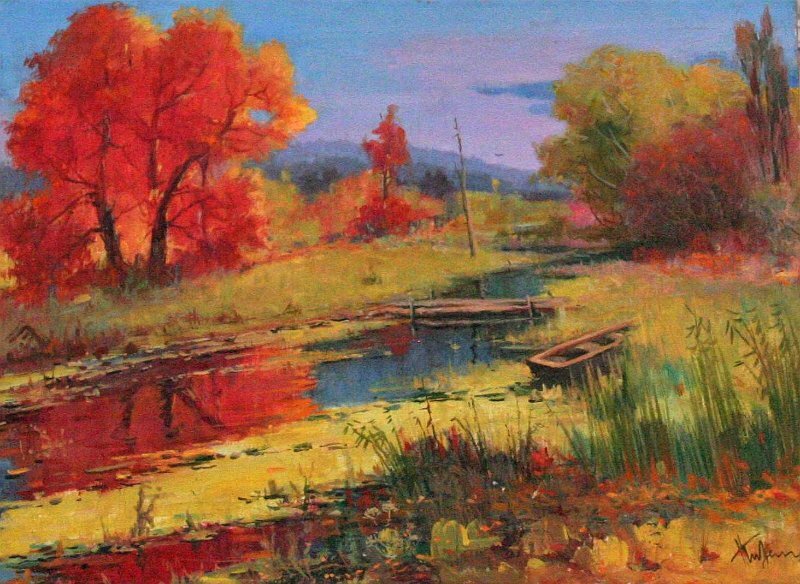 Oil on canvas of a fall scene. Kyzenko had the amazing ability to make all colors of water look believable. 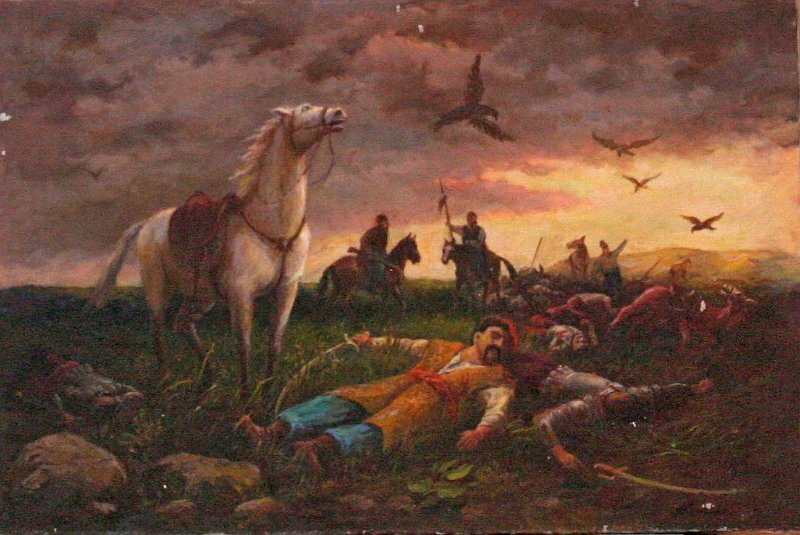 Battle in the Steppes, an omen. Nestor Kyzenko Self portrait as a young man. He was most likely born Ukrainian Orthodox Christian. Up to 10 million lost their lives from 1932 - 1933 during Holodomor (literally, "death by starvation" ) explained in this short film. 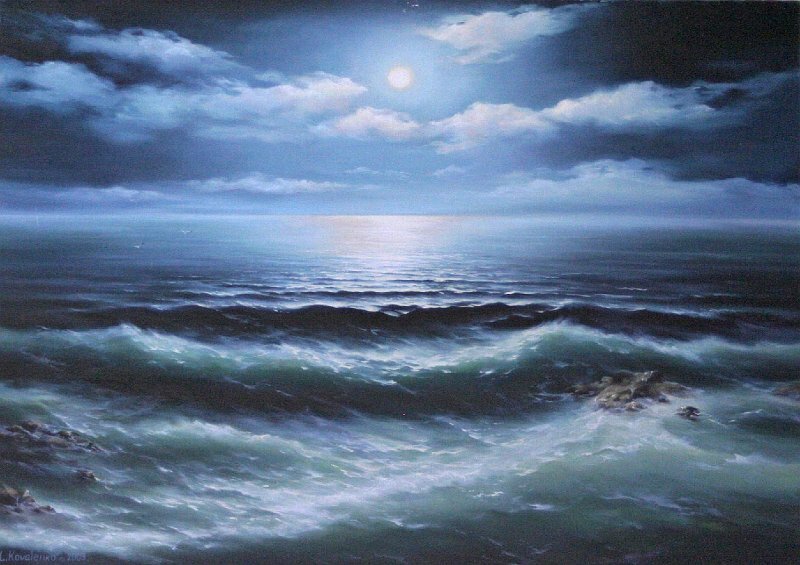 Here's one of my favorites by Larysa Kovalenko called "Evening". 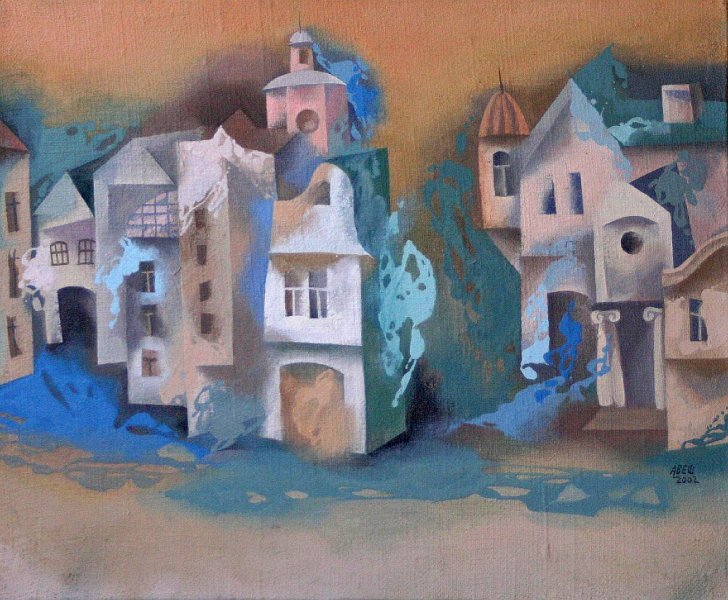 A more up-to-date view of a small town done in 2002 by Anatoliy Shevchenko called "Blue Street". Modern small town. Note the TV antennae. Vitaliy Panasiuk - "City Center"
Fleeing persecution in Russia and Eastern Europe between 1880 and 1924, more than 2.5 million Jews left their small towns, or shtetls, behind and embarked for a new land -- America. A host of kids from New York City's Lower East Side -- Irving Berlin, George Gershwin, Sophie Tucker, Molly Picon, Eddie Cantor, Fanny Brice, The Marx Brothers, Benny Goodman, Artie Shaw, and many others -- grew up to capitalize on a vast heritage of Yiddish music and culture, taking 20th-century American entertainment on a musical joyride. Hosted by actor and playwright Harvey Fierstein, written and directed by Fabienne Rousso-Lenoir, FROM SHTETL TO SWING tells the story of the cross-pollination of Jewish and African-American musical influences, two traditions born out of exile and longing, yet charged with an energy and freedom that gave voice to a new multicultural America.